White rice is a staple food for many Asian countries, serving as a main food source for over half the world's population, according to Utah State University Extension Agent Jana Darrington. White rice, which has been refined, has the husk, bran and germ layers removed, so just the white inner kernel remains. Removing the outer layers removes much of the nutritional value; enriched rice products have nutrients added back in an attempt to equal the original nutritional value. 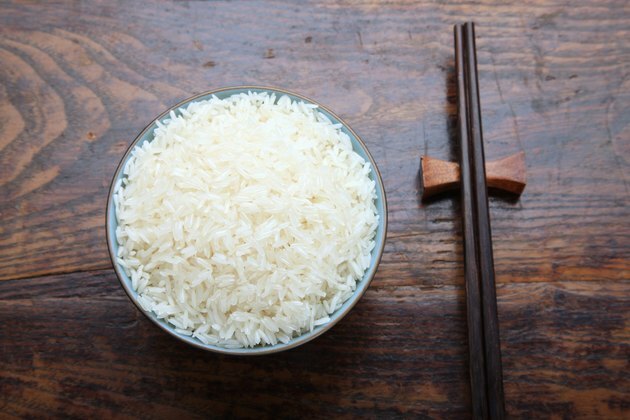 White rice, particularly instant white rice, has less nutritional value than brown rice. White rice is a good calorie source; 1 cup of cooked white instant rice contains around 165 calories, while unenriched parboiled white rice contains 205 calories in 1 cup and brown rice contains 216 calories in 1 cup. Most of the calories in rice come from carbohydrate; brown rice and most non-instant white rice have around 44 g of carbohydrate per serving while instant white rice has 35 g. Broen rice offers more fiber than white rice, at 3 grams per serving versus 0.6 grams in white rice. Rice also contains protein -- 5 g per serving for brown rice, 3.3 g for instant white rice and 4 g for non-instant white rice. Even enriched instant or parboiled white rice has fewer vitamins and minerals than brown rice, with the exception of iron. Brown rice has much higher levels of phosphorus and magnesium -- two nutrients that nourish your skeleton -- as well as selenium and manganese, two antioxidants. Enriched rice has iron, niacin, thiamin, and folic acid added. Iron and folic acid promote healthy red blood cell function, while niacin and thiamin support your metabolism.